Arbequina, Alfonso, Halkidiki, Picholine, Leccino and Edremit stone in olives in rapeseed oil. A selection of stone in olives from around the world: French Picholine, Spanish Arbequina, Italian Leccino, Greek Halkidiki, Turkish Edremit and Peruvian Alfonso. INGREDIENTS: Arbequina Olives, Alfonso Olives, Halkidiki Olives, Picholine Olives, Leccino Olives, Edremit Olives, Salt, Rapeseed Oil. 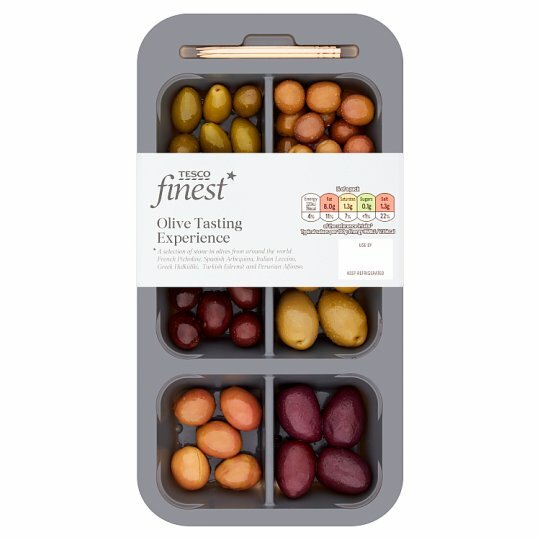 Packaged in a protective atmosphere.Olives contain olive stones.Warning: This product contains sharp wooden skewers.